I truly consider myself a blessed person. so many creative, talented, versatile and positive people. And as they say "like attracts like", quite often I receive mails from like minded people who share their work with me and I always love to see different kind of art forms and how an art reflects the personal flair of the artist. 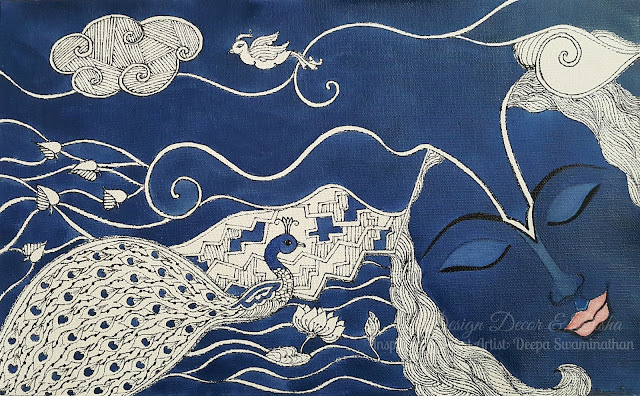 One such artist is here on 3D with us today: Deepa Swaminathan, a self taught artist from Dubai. Welcome Deepa on 3D! Please tell us more about your self. Deepa: With no formal training or qualification in Art, I have simply followed my heart to pursue my passion to paint. My children who took to art from a tender age inspired me to revive what was a hobby in my teens. 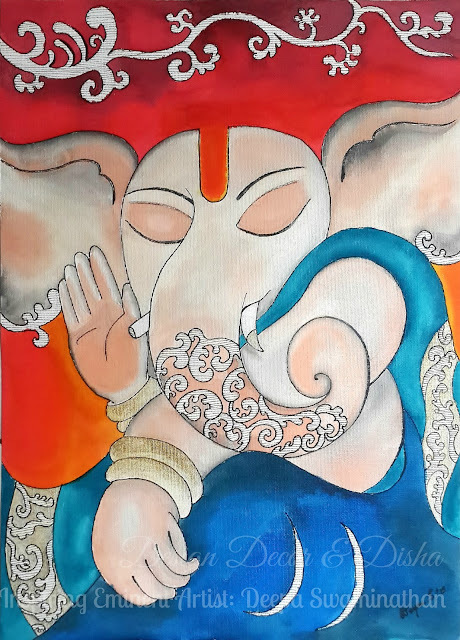 Apart from exploring various subjects and media, teaching Art to children of different ages from my home in Dubai gives me immense satisfaction and ample inspiration to explore new subjects for my ever expanding canvas. Intrigued by spirituality, culture and philosophy, I like to bring a glimpse of them in abstract and finite forms on to my canvas through colourful expressions. Art, for me, therefore is a way of life, a path ! I love giving myself to the strong urge to do detailing in Mixed Media which gives me a holistic experience of various techniques. I believe, every creation is born at its assigned moment, blessed with life to spread joy. So is every Artwork...born with its own destiny and presence to bring the joy of colours into a room where it breathes. The purpose of my Art is to infuse positivity into the viewer and offer an Artistic perspective to the brighter side of life. Since life is as much an Art, I believe Art must encapsulate the most important aspect of life … Hope and Optimism ! And I must say Deepa, you are successfully infusing the positivity into the viewer. I loved your distinct style. Your paintings have some hypnotizing quality. Thank you so much for sharing your wonderful and awe inspiring work of art here with all of us. I Wish you good luck and sending lots of positivity your way. 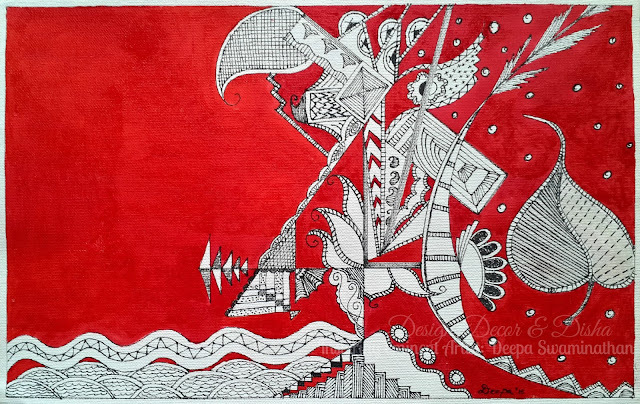 Dear readers you can check out more of Deepa's mesmerizing artwork on her Facebook page: Deeparterium. Hope you enjoyed reading meeting Deepa as much as I did. I always talk about home decor, but in my next I'll be talking about home security and saftey. That is I think the most important thing in today's context, so stay tuned!! P.S. All the images are provided by Deepa Swaminathan and subject to copyright. Please seek her permission before using any of these images.